While we all try to limit the amount of toys we buy our children, it’s not long until there’s a huge buildup of clutter in their bedrooms. As other family members start chipping in with gifts, it’s surprising just how many options kids can have today. 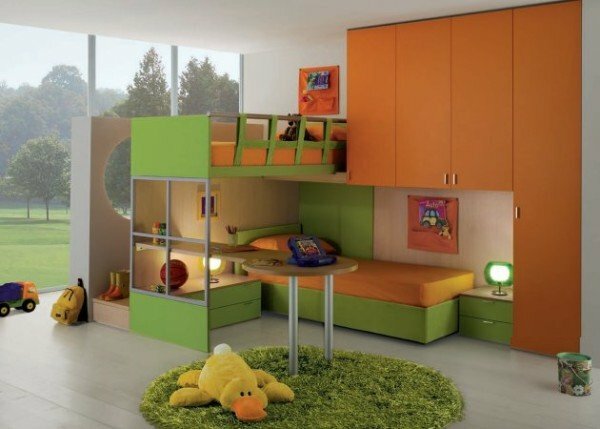 This is why coming up with unique storage solutions for children’s rooms is so important. Keeping stuff stored under the bed might seem an obvious choice, but when it’s time to get them back out kids will often end up pulling out everything available and you can be certain that tidying up won’t be their first priority. Fortunately, there are lots of bed frames that come with built-in storage options. These Stompa singles found here give you a greater range of drawers, shelves and openings to keep things neat. Mid-level or high sleeper beds are also another great way to utilize the most of your space. These place the bed high up, like a bunk bed, but use the underlying space for a desk or other useful solutions. If you don’t have any more floor space to utilize, remember to think vertically and add some shelving. While it might be tempting to build all the way to the ceiling, a small child could easily try to scale the shelves trying to get a specific toy on the highest shelf. Keep it safe and be careful of what you place on the highest points. A more unique way of doing this is to use magnetic strips to hold metal toys, like toy cars. You can use the same strip as what you’d use for a magnetic knife holder in the kitchen. Not only does this provides a great way to keep things organized, but it’s also inexpensive. Finally, finding good storage containers for your child’s room can be harder than you’d imagine. You’ll need something that’s sturdy enough to withstand some wear and tear and preferably that could double up as another piece of furniture. Large trunks are a great way to store a large amount of toys. They can also be used to fit in with a variety of different themes in the bedroom, too, like pirates or fantasy. Similarly, if you regularly read to your child in bed, rather than using a standard bedside table consider using a small storage cabinet to give yourself the a few more options instead.